The Paper Cutters: Little Red Wagon Challenge #365-Stencil It! Little Red Wagon Challenge #365-Stencil It! Hey there! This week our Little Red Wagon Hostess is Kate. The challenge is to use a stencil on your project. I found this very challenging for me since I don't have any stencils. However this challenge is perfect for those of you in the same situation as me! That's why we call it a challenge....wink, wink. Let's do this challenge together! Here is what I did. I used a My Favorite Things Chevron die. I just cut out the die and then used my Distress Inks to create my yellow Chevron background. See! Easy peasy!! So come on over to the blog for some pretty amazing inspirations from all the Girlfriends. Here is a link to the http://lilredwagon.blogspot.com blog. Kate will post her top picks on the blog next Tuesday. 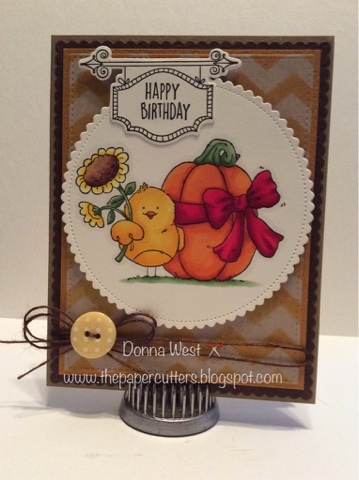 Such a fabulous fall card! Your stenciled chevrons look amazing! I just LOVE that background!! So glad you figured out a way to create a stencil! Another Girlfriend-made stencil - so cool! Wonderful card, I love that circle die cut. So cute. Glad you were able to figure out how to make a stencil too. Great job. Love the chevron background, perfect idea...you and Heather were on the same wavelength...darling image too! red color wagon looks too good...!!! !